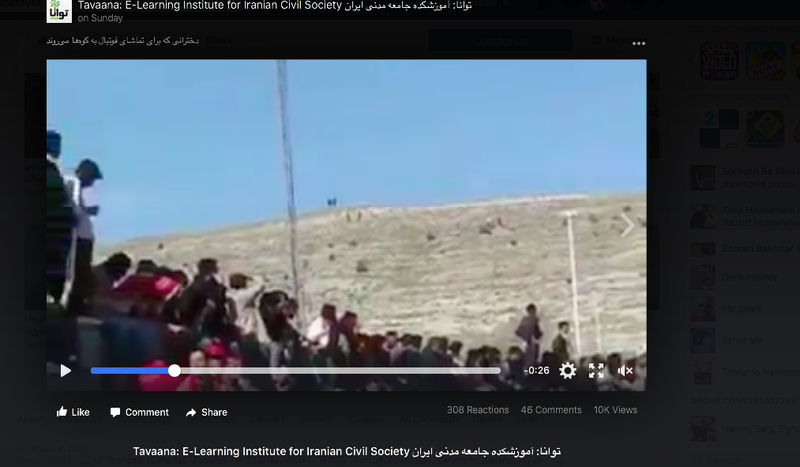 According to news, Iranian women from Tabriz city supporting the " Tractor " Soccer club went on the hill around the stadium to watch the game. This video shows women holding Tractor club flag are going up to the hill nearby the stadium to watch their favourite team soccer game. According to Islamic Sharia law Iranian women are banned to enter the sport stadium when men are playing. These are the words from Hamid Baghaei the deputy of former president Ahmadinejad to Ejei and judiciary power . He was imprisoned recently for corruption charges and was released on bail when went on hunger strike. After release from jail accompanied by Ahmadinejad and Mashaie, he said those words to the reporters . 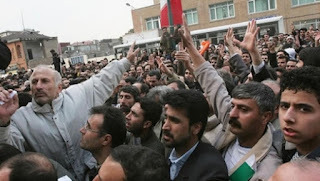 Following his comments , Ahmadinejad and Mashie also in support of Baghaei criticized the judiciary power and the system. This situation created attention by public and These types of criticism within the officials in the Islamic regime seems to continue in the future. We are the signatories to this letter, many of whom have been Iranian prisoners of conscience, and have witnessed widespread human rights violations and instances of mental torture of women and men who have been imprisoned for up to 20 years because of political and civil activities. The reason is merely religious, ideological, and political beliefs. The well-known lady such as Fariba Kamalabadi, Mahvash Shahriari, Maryam Akbari Monfared, Zahra Zehtabchi, Fatemeh Mozhany, Narges Mohammadi, Etienne Dami, Reyhaneh Haj Ibrahim, Nazim Zargaran, and others who are not going to short-hairedly go to the individual conditions of these women and men. Professionals who have been named in the Islamic Republic of Iran as security prisoners. Of course, we have been imprisoned for a while, and we have witnessed various injustices from the Islamic Republic of Iran towards them. The purpose of writing this letter is to try to save the man who seems to have been threatened by the Revolutionary Guards for months, in addition to his imprisonment, all human rights and even their health. 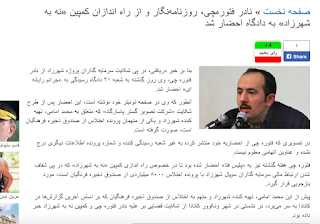 The text of the report is in the description of Ziel: Arash Sadeqi, a political prisoner sentenced to nineteen years in jail and detained in a prison sentence of three hundred and fifty times in Evin Prison, is still deprived of proper medical care and medical care in spite of a serious deterioration, and during the last days all his deportations to the hospital have been canceled. He suffered severe physical injury during and after the hunger strike, and he became worse due to lack of treatment and medical treatment, and had to use many drugs. Medications that are only temporary and require immediate and appropriate medical treatment. He is also unable to eat and digest solid foods and can eat a meal a day. Doctors have already told her that they have to use gastrointestinal drugs for many years, given the damage to the stomach and gastrointestinal tract. Arash Sadeghi also suffers from pneumonia and asthma after a hunger strike. He suffers from kidney and urinary tract infections and antibiotics that do not have the ability to drink water in the stomach and does not have the necessary vitamins. Sharpen the right kidney. Arash Sadeghi has been losing more than 20 kilos to the detriment of healthcare institutions and the judiciary. 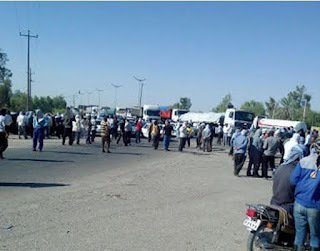 According to news , workers of " Neyshekar Haft Tapeh " from the Union Of Free Workers together with several members of their families for the second days continue their protest against the employers who do not pay attention to their demands in the past. This morning the workers of Neyshekar Haft Tapeh together with their families protested in front of the factory and when they noticed the employer do not pay attention to their demands , they have decided to continued a long walk of 10 kilometre to the " Ahwaz -Andimeshk International Highway " and closed the road for several hours . After several hours of protest by closing the highway and creation of heavy traffic , workers decided to open the road and stage the protest in front of the factory again. Because of this, Nasiri Afshar the head of the factory attended at the protest and promised to deal with the workers demands but workers chanted " Afshar , Shame on you - Leave the Neyshekar and go ".When Afshar saw the workers are ver angry ,he left the scene and the police forces throw tear gas towards workers and as a result the glasses of several cars were broken. Its been 15 months now since the Government gave the factory to a private company and president Rohani does nothing to solve the workers problem. According to news, police have prevented Iran Writers Association to have a gathering to honour Ahmad Shamlou the great Iranian poet on his 17th commemoration at " Imamzadeh Taher " Cemetery in Karaj city. Regime agents have arrested at least three citizens including Bektash Abtin a board member of the association and transferred them to an unknown location. said Reza Khandan Mahabadi the spokesperson for the Association. According to Mr. Mahabadi , the police and agents closed the door and prevented the people to enter the cemetery and at the end dispersed them. He added,: " This year again the regime agents did not allow us to commemorate the life of Shamlou the great Iranian poet. Mr. Mahabadi speaking to Human Rights Campaign ,said : The agents had plain cloths and it is not known if they had order from the judiciary to prevent the event . They were shouting and threatening people , they dispersed people and at the end arrested three and transferred them to an unknown location. (Beirut, July 20, 2017) – The Iranian government should immediately halt all executions for drug-related offenses while parliament debates amendments to reform the country’s drug law, Human Rights Watch said today. Parliament is expected to vote in two weeks on an amendment to the drug law that would drastically increase the bar for a mandatory death penalty sentence. On July 16, 2017, parliament approved a proposal to amend Iran’s 1997 Law to Combat Drugs to limit the death penalty for some nonviolent, drug-related offenses. However, parliament sent the draft legislation back to the parliamentary judiciary commission for a fourth time to deliberate the proposed changes for certain offenses. Under Iran’s current drug law, at least 10 offenses, including some that are nonviolent, are punishable by death, including possession of as little as 30 grams of synthetic drugs such as methamphetamines. The law also mandates the death penalty for trafficking, possession, or trade of more than five kilograms of opium or 30 grams of heroin; repeated offenses involving smaller amounts; or the manufacture of more than 50 grams of synthetic drugs. On December 6, 2016, 146 members of parliament introduced a draft amendment that sought to replace capital punishment for drug offenses with imprisonment for up to 30 years, while allowing the death penalty if the accused or one of the participants in the crime used or carried weapons intending to use them against law enforcement agencies. The death penalty also would still apply to a leader of a drug trafficking cartel, anyone who used a child in drug trafficking, or anyone facing new drug-related charges who had previously been sentenced to execution or 15 years to life for drug-related offenses. Under pressure from the judiciary and administration, however, the judiciary commission retracted part of their proposed amendments on July 9. It added the death penalty for nonviolent charges of “production, distribution, trafficking, and selling” of more than 100 kilograms of “traditional” drugs such as opium or two kilograms of synthetic drugs such as methamphetamines. The commission also restored the death penalty for possession, purchase, or concealing more than five kilograms of “synthetic drugs.” In both cases the death penalty would only apply where the accused had previously been sentenced to more than two years for drug-related offenses. On July 18, Hasan Noroozi, the commission’s spokesman, told IRNA news agency that the commission is adding “possession, purchase or concealing” 50 kilograms of “traditional” drugs to the offenses punishable by death. On April 9, the commission proposed to apply the amendments retroactively, which would dramatically reduce the number of people currently on death row in Iran. In addition, on July 5, judiciary commission members asked the judiciary to suspend executions of drug offenders until parliament could vote on the bill. 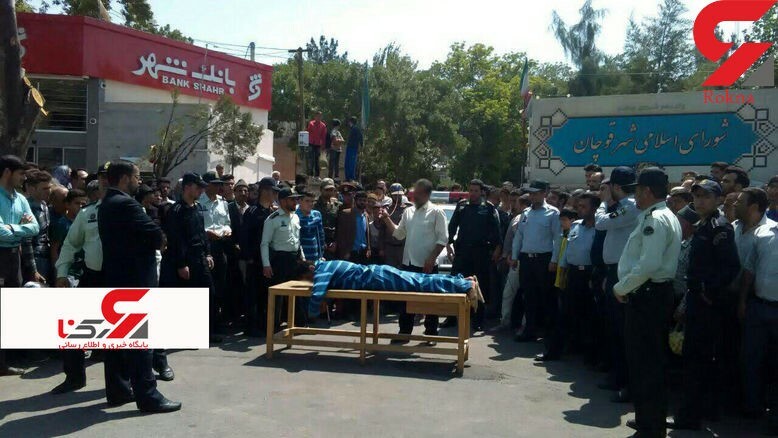 A Human Rights Watch review of the Norway-based Iran Human Rights Organization’sdatabase, which documents executions in Iran, shows that Ghezelhesar and Karaj Central prisons have not carried out any executions since the beginning of Ramadan on May 26, but that other prison authorities in Isfahan, Western Azerbaijan, Kurdistan, Sistan and Baluchestan, and Khorasan Razavi, have continued to execute people convicted of drug offenses. The group said that the authorities have executed at least 39 people since July 5 on drug-related charges. Iran has one the highest rates of executions in the world. According to Amnesty International, in 2016, Iran executed at least 567 people, the majority for drug-related convictions. In December 2016, Noroozi, the parliamentary judicial committee spokesman, urged parliament to amend the law, stating that 5,000 people are on Iran’s death row for drug-related offenses, the majority of them ages 20 to 30. Human Rights Watch has repeatedly documented serious violations of due process, torture, and other violations of the rights of criminal suspects facing drug-related charges. Such flawed judicial proceedings heighten grave concerns about the application of the death penalty. Under article 6(2) of the International Covenant on Civil and Political Rights, which Iran has ratified, countries that still retain capital punishment may apply the death penalty only for the “most serious crimes.” The United Nations Human Rights Committee, the independent expert body that interprets the covenant, has said that drug offenses are not among the “most serious crimes,” and that the use of the death penalty for such crimes violates international law. Human Rights Watch opposes capital punishment in all circumstances because it is inherently inhumane and irreversible. Anthropologists and historians don’t make natural friends. The former usually accuse the latter of engulfing themselves in documents, without getting a real feel for the places and people they study. But Xiyue Wang, 37, the Chinese-American graduate student of history at Princeton, who Iran has sentenced to 10 years in prison on charges of espionage, was not your typical bookworm. News of the sentence was released on July 16, though Wang has been in prison since August 2016. Perhaps this is why he struck up a friendship with an anthropology student at Princeton, who agreed to talk to IranWire on condition of anonymity. The Princeton student has known Wang for many years, from when they were both undergraduate students at the Jackson School of International Studies at the University of Washington. He was researching Islam in China, which meant they had a lot of common interests, he told me. “He has boundless intellectual curiosity and drive, constantly reading more and more, never satisfied, always eager to share his discoveries, to further his and others’ understanding,” Kotkin said. Wang’s Princeton friend says he had a general thirst for field work. “He went there to feel the soil beneath his feet, to eat the food, to be with the people, and to find books that aren’t just imperial collections,” he says. But he also says the two never discussed Wang’s trip to Iran. “Wang is certainly not a spy. He would be lousy at it. He’s way too curious. He is always the guy to start awkward conversations or ask questions he shouldn’t,” his friend says. It was probably the same sense of curiosity that took Xiyue Wang to Afghanistan in 2010, where he served as a Pashtun interpreter for the International Committee of the Red Cross (ICRC). According to the Tab, Princeton's edition of the student-run news network, a magazine published by the state-run China News Service ran a feature on him, highlighting that he was the only Chinese national working with the ICRC in Afghanistan at the time. The Chinese magazine said Wang had gone the extra length of helping emergency health workers in war zones and even visiting obscure locations to retrieve injured or deceased Taliban combatants for treatment or burial. “What we really care about is that while detained by the American military, [everybody] would have enough food, water, and if you are a Muslim, whether you have religious freedom, whether you can pray, seek a doctor, or ask to see your family,” the 2010 article quoted him as saying. Another former classmate of Xiyue Wang who studied with him at Harvard and traveled with him to Tajikistan remembers him “as an avid student and a warm, cheery person,” he told IranWire on condition of anonymity. Wang was arrested in August 2016, according to reports by Mizan, the mouthpiece of the Iranian judiciary. But the news of his situation was only released yesterday, on July 16, 2017, when Gholamhossein Mohseni Ejei, the powerful deputy head of the judiciary, said he had been sentenced to 10 years in prison. 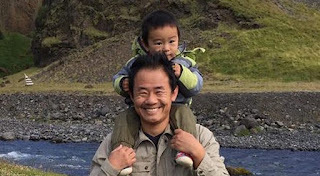 As often happens with arrests in Iran, Wang’s family and Princeton University had not made the news public, hoping to secure his release through behind-the-scenes negotiations. As usual, this tactic was not successful. Wang is said to be married with one child, but no further information about his family was available at the time of reporting. Ejei failed to provide Xiyue Wang’s name when announcing the sentence. He simply referred to him as a “US tool of infiltration who holds double nationality and was controlled directly by Americans.” He said the convicted student was part of the “infiltration project” that Iran’s Supreme Leader Ayatollah Khamenei has been warning about for some time. 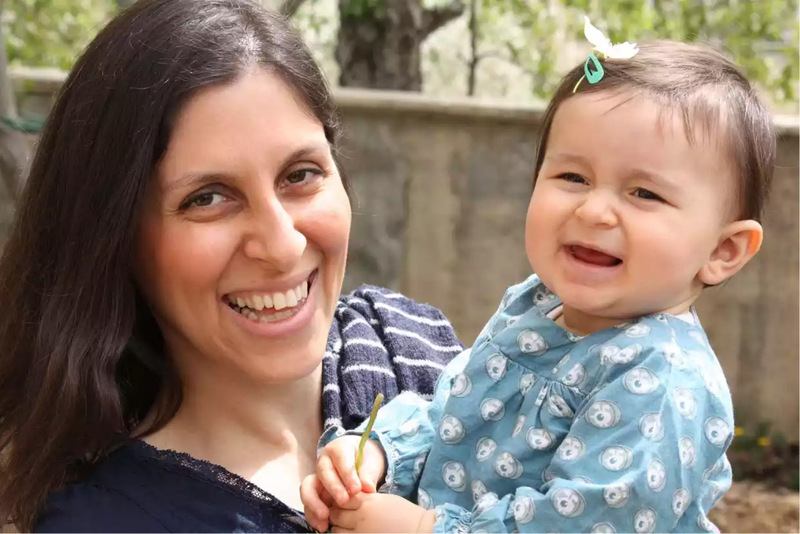 Iranian journalists including Ehsan Mazandarani and Isa Saharkhiz have also been accused of being a part of this Western-led conspiracy, as have jailed dual nationals Nazanin Zaghari-Ratcliffe and businessman Siamak Namazi and his father Baquer Namazi. Nizar Zakka, a Lebanese with permanent US residency, is also behind bars in Iran accused of being a spy for the US. At the center of these accusations lies the Sharmin and Bijan Mossvar-Rahmani Center for Iran and Persian Gulf Studies at Princeton. Xiyue Wang is accused of “digitally recording 4500 pages of the country’s documents” and sending it to the Center, “the research team at the State Department,” The Kennedy School of Government at Harvard and the British Institute of Persian Studies. Analysts say the move is probably part of the efforts by the judiciary, which is controlled by Iranian ultra-conservatives, to put pressure on the government of President Hassan Rouhani, who was re-elected in May. Once again, it would appear that an innocent student has become a random victim to the vicious powerplay of Iranian politics. It is not uncommon for scholars visiting Iran to get caught up in politics, and to face arrest and imprisonment. Homa Hoodfar, an Iranian-Canadian professor of anthropology at Montreal’s Concordia University, was arrested in March 2016 and spent 112 days in Tehran’s notorious Evin prison, where members of Iran’s Revolutionary Guards Corps subjected her to psychological torture. However, this treatment is less common for scholars who are not of Iranian descent. The Chinese embassy’s spokesperson told told the Tab that Mr Wang lost his Chinese citizenship automatically upon receiving citizenship from another country. “As Wang is an American citizen, the United States will be handling this matter. We have little room for involvement,” the spokesperson added. A Statement released by Iranian human rights organizations demanded Monday July 17 be named as " Imprisoned Mother's Day ". On July 17 two years ago Narges Mohammadi's Children left Iran for Paris to a safety and currently live with their father there. 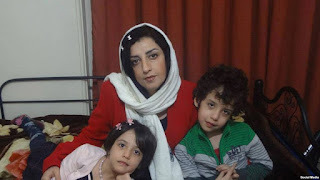 Narges Mohammadi the mother of the two beautiful children is sitting in prison , she was sentenced to 16 years imprisonment for just defending the human rights. Narges is the vice president of the Iran Human Rights Defenders . Narges Mohammadi have started writing about mothers who are in prison and longing for their children. She named her writings as " Motherly " writing from the heart since the beginning of her sentence two years ago. And the signatories to this statement selected Monday July 17 as the " Imprisoned Mother's Day " . 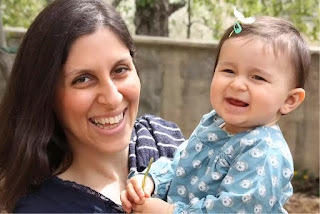 Currently many mothers, political and none political are in prison far from their children including Nazanin Zaghary the Iranian -British Citizen who is married to a British National with one kid. 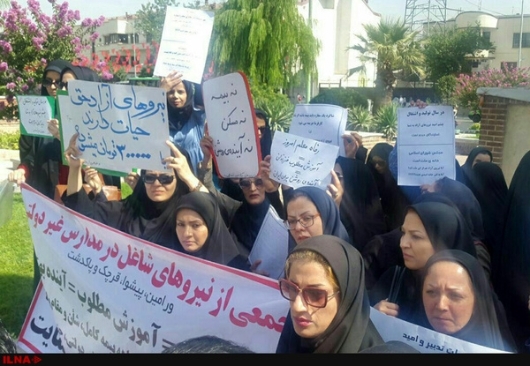 A group of teachers demanding justice by signing a petition demanded for the freedom of Mohsen Omrani the teacher from Bushehr city . Mr. Omrani is a teachers rights advocate and because of his activity in this field he was sentenced to a year in prison and since the end of May this year he is in Bushehr prison. Mr. Omrani at his preliminary court hearing was sentenced to six years in prison but with the effort by his lawyer in appeal court this sentencing reduced to one year imprisonment. According to what Journalist Nader Fotorehchi wrote on his tweeter account , the complainant against him is Mr. Mohammad Emami one of the financier of the Shahrzad TV series and his company " Pasargad Tasvir Gostar Co. " and he is one of the accused in the "embezzlement of the reserved teachers funds " of 8000 Billion Tuman ( One dollar is close to 4000 Tuman ) . Nader Fotorehchi was summoned yesterday to the division number 31 of the court of revolution. He is allegedly accused of " Computer crime " crimes that are related to the use of computer . 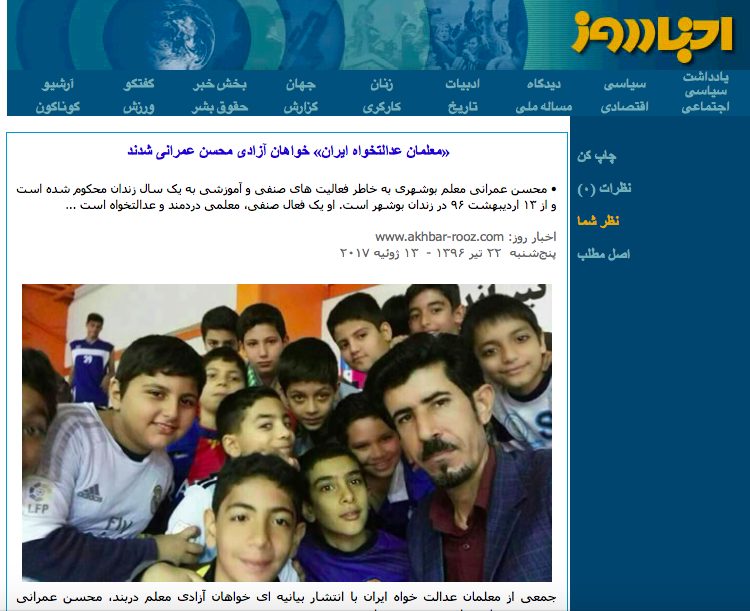 Mr. Fotorehchi was also summoned last week to the " FETA Police" on the charges about " Shahrzad TV series ". Seven gang members who disturbed the public safety of Quchan with non-firearm weapons and shows of force have been flogged in public, according to the Public and Revolutionary Prosecutor of Quchan. Azari stated that one of the most important factors behind such strife is a lack of charity among people, which incites fighting over the smallest of incidents. “If some individuals fail to respect the culture and community of the people, punishments will assuredly await them. A culture of fighting and insult is an indication of a lack of cultivation and cultural decline,” he emphasized. The Public and Revolutionary Prosecutor said that the gang members would been monitored for six months by the county’s “Anger Room” in order to prevent further crimes. 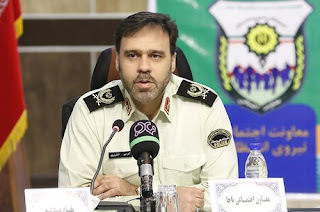 “We ought to show, with the general public taking part, that Quchan is considered a first-rate city in Razavi Khorasan when it comes to safety, and that a precondition of this is promoting social participation,” he added. Azari related that 100 operations had been carried out in the county, and that crime had declined by 50%. “Ten gang members who took part in group brawls in four stages in recent months were pursued by the judiciary. Three of them are presently on the run,” he said. 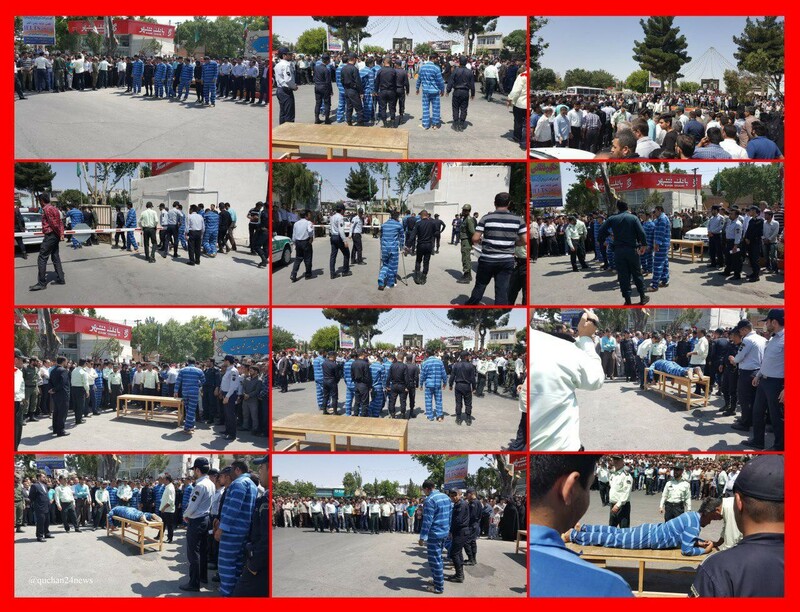 According to reporting from Rokna’s events team, a sentence of 74 lashes for seven gang members was carried out this morning in Quchan County. According to MIZAN news which is part of the judiciary power , the ambassadors of 45 foreign countries were invited to Evin prison on Wednesday and they visited sections of ward number 4, Tailoring workshop , medical clinic and Traditional sports arena known as Zoorkhaneh . 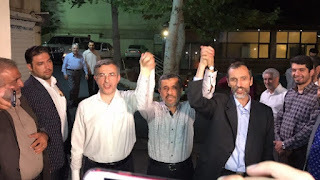 Pictures that are distributed by the news agency indicates that, the judiciary and Evin prison authorities welcomed the ambassadors with red carpet. This news agency wrote that, each room has six beds with red bedsheets and uniform carpets and the prisoners are feeling comfortable. 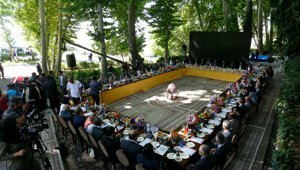 The reports indicate that, the location is in the north of Tehran with " very good weather " , in a wide area with " live music " by a " musician from Uganda " applauded by the audience together with the " bell of Traditional sports gymnasium" and the " best food" . The report goes farther and says , the occupants of this area " speak English " with foreign guests and can have time with their wives for hours under rooms equipped with" bed ,refrigerator, bath and washrooms " . 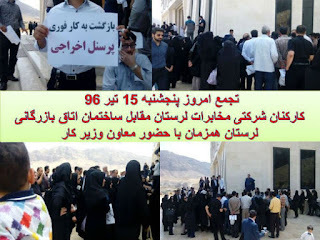 This is the pictures the regime media reported about Evin prison during the visit by 45 foreign countries ambassadors . Pictures which was completed by interviews with foreign ambassadors .
" At the time of visitation i was joking and i said ;the condition here is so good that some prisoners may prefer to stay in prison ".
" I did not expect the condition here be this much good and i was impressed by the visitation ".
" while laughing in response to a question about the food of prisoners , he said ; I did not taste the food of course , but i saw the prison condition is hygienic "
This way of reporting about one of the most horrendous/ fearful prison in the world is just a joke to all those political prisoners who have spent time in the Evin prison. It is very clear the past and present political prisoners think this is a joke and have many horrible things to say about their experience in prison under this regime. This is a scenario engineered , organized and orchestrated by Javad larijani the head of the regime human rights commission in collaboration with his brother Mohammad sadegh larijani the head of the regime judiciary power. this is a joke because even those ambassadors knew what is going on in Evin prison. by this show, regime in fact is trying to buy some reputation in the world for itself . If truly regime wants to show what is happening in its prisons and on political / regular prisoners , it must invite the UN human rights reporter to visit Iran and see the Evin prison in particular. 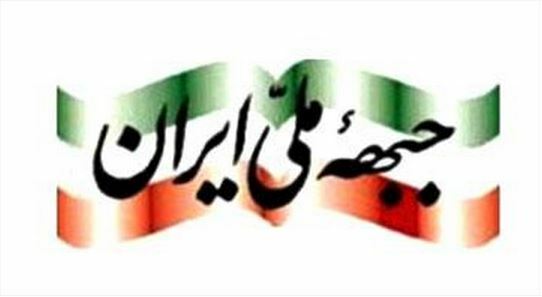 According to news by HRANA, after the previous prevention of "Iran national Front " Central Council gathering by regime's ministry of intelligence , this time the central national council decided to gather on Monday in the house of Zia Mesbah , but it was again cancelled because the host of the meeting was summoned on Sunday to the ministry of intelligence and was warned not to hold the meeting . Zia Mesbah was summoned by the security agents of the Ministry of intelligence on Sunday and was arrested and interrogated on Sunday for few hours and was warned not to hold the meeting or else the disciplinary forces would be called to prevent the national council members from entering the house. The meeting of the national central council supposed to take place on last Monday with five main National Front personality and 10-15 members of the council . On May this year the Iran National Front meeting was also cancelled. At that time the meeting was supposed to take place at Mr. Asghar Fanipour's house , but it was cancelled when Mr. Fanipour was also summoned to the ministry of intelligence and warned not to hold the meeting . Iran Watch Canada:Members of "Iran National Front " are the followers of the late Prime Minister of Iran Doctor Mohammad Mossadegh whose Government was toppled by Coup -d'etat by CIA and MI6 on 1953. According to news , protest by the contract employees of the communication ministry continued in all over Iran until today. 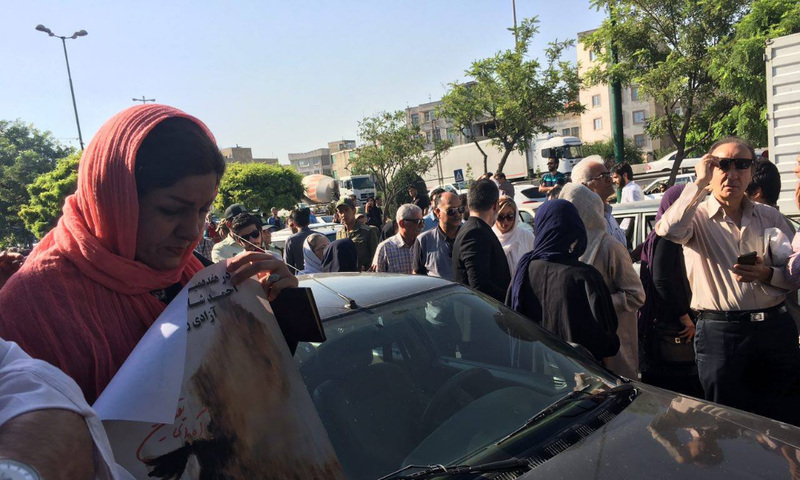 The news and pictures have been reported this morning in online social media shows that the protesters gathered in front of the labor ministry in the city of Shiraz - Fars province and Lorestan province . The Free Workers Union which have reported about this protest by pictures and news have wrote : in Lorestan the protesters gathered in front of the trade ministry while the deputy minister of labor was there. The protesters demanded for : immediate return to work and classification of job titles and justice based on salary. Around 23,000 employees who have working experience between 10 - 20 years , are working as contract employees. ILNA news agency reported that, on Monday teachers working in private schools from all over Iran protested in front of the parliament in Tehran for their rights and job security. This teachers do not have the benefit of insurance and job security . One of the teacher said: " What is the difference between us and the teachers who are employed officially ? We are doing the same job but receive less salary . We do not have income in summer and we have no insurance and this is not acceptable . " According to news , Commander Said Montazerolmahdi the spokesperson for the Police Forces today said that :" inside the people's car isn't part of their privacy" , but some Ayatollah believe otherwise. 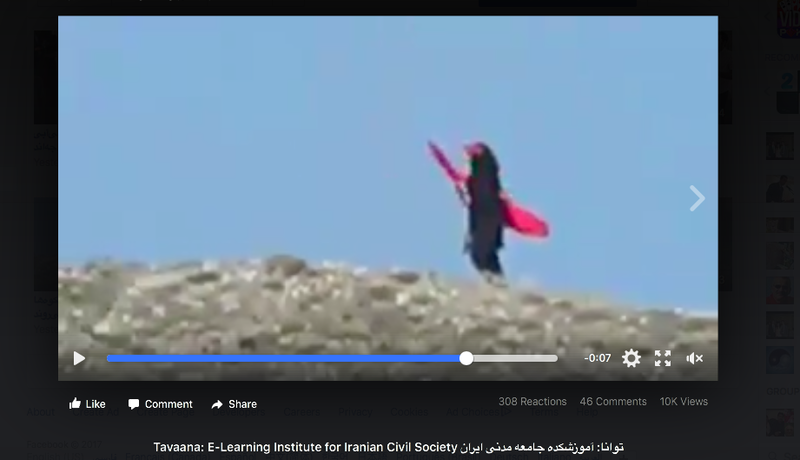 This discussion is part of the regime's policy towards Iranian, particularly women. 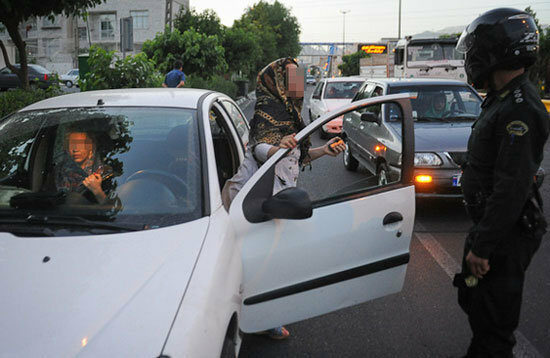 They stop their car and search if they are with men or their Hejab ( dress code) violates the Islamic dress code . Summer time the weather in most of the Iranian cities become extremely hot and it is unbearable to have veil . For not breaking the Islamic laws the police forces stop the cars and search for such violations. 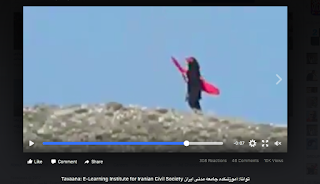 IRAN WATCH CANADA: Islamic regime in Iran is an apartheid regime against women . According to news coming from Iran , on last Saturday Ms. Fatemeh Daneshvar ,Tehran City Council woman on responding to a reporter from Fars news agency regarding the news that, street working children were seen jammed in a truck in Modares Highway and sometimes they are being disappeared and their lifeless bodies are found in the outskirt of Tehran without kidneys and eyes ......said: " I did not hear about this news and i don't know what is the story , but family rent their kids for work and money. This family members sometimes don't see their kids for weeks and they believe one day they will return home anyway . " Ms. Daneshvar said : " We have warned the parents repeatedly about selling their kids . She added that, in the dangerous area such as Harandi district in Tehran , children are lost and the parents don't even make complaint about it. "